This utility makes it easy to display a custom error message for formulas that produce an error. Instead of an error such as #N/A or #VALUE!, you can have your own (more logical) error message displayed when a formula results in an error. For example, if you have a VLOOKUP formula but no result is found then the formula will then display the value #N/A. You use can this utility to tell Excel what it should display when the formula results in an error, for example to display nothing (an empty result) when no result is found or a user friendly message such as "country not found". This utility wraps an =IF(ISERROR(old_formula),[value in case of error],old_formula) formula around the existing formulas. 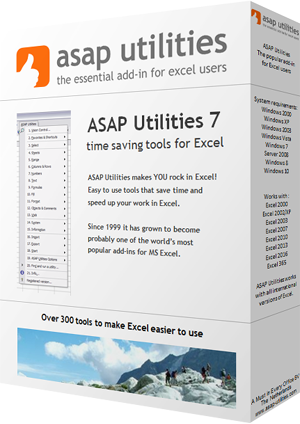 You can do this manually, but it is easier and faster with help of ASAP Utilities. 1. It is easier and quicker because you don't have to type in the formula. 2. You can also use this utility on a range of cells with different formulas.